The Ravello Festival used to be called the Wagner Festival, a music event held (for the first time in 1953) in honor of the German composer, who visited the area in 1880 (see this link). The event has now gone well beyond presenting Wagner’s music. This year, the whole shebang runs 127 days (! )—from late June through late October and, besides music, includes, art shows, dance, photographic exhibits, discussions and film. The orchestra is the brain-child of pianist-conductor Barenboim and Palestinian-born writer and Columbia University professor Edward Said (who passed away in 2003). The unlikely (unfortunately) combination of a Jewish musician and a Palestinian writer working together to promote peaceful co-existence in the Middle East resulted in the first West-Eastern Divan Workshop. It took place in Weimar in 1999 and involved young musicians between the ages of 14 and 25 from Egypt, Syria, Lebanon, Jordan, Tunisia and Israel. The workshop was held in Chicago in 2001 and since 2002 has had a permanent base in Seville, Spain. Following each workshop, the orchestra goes on tour; the two concerts in Ravello this summer are the only appearances in Italy on the 2008 European Tour. Throughout its existence, the young musicians have been supported by financial grants and musical instruction from some of the world’s finest musicians. The orchestra is the subject of a recent documentary film, Knowledge is the Beginning, produced and directed by Paul Smaczny. 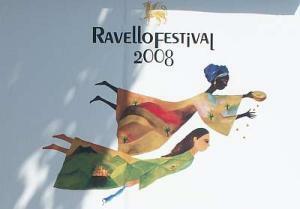 Also see Ravello 2005 and 2014.